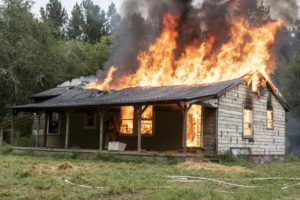 Stem, NC – Students and instructors from a Vance-Granville Community College (VGCC) Fire Control class burned an abandoned farmhouse on land owned by Tar River Land Conservancy (TRLC) in Granville County on September 9, 2018. The burn was conducted to simulate the conditions faced by firefighters responding to residential fires. The training burn helped 28 firefighters to complete the VGCC course and obtain state fire control certification. Fire Chief Chris Wright and Battalion Chief Ken Reeves of the Vance County Fire Department taught the VGCC Fire Control course and oversaw the training burn. Students participating in the burn included firefighters from several departments in Granville, Franklin and Vance Counties, including the Stem Fire and E.M.S. Department, Butner Public Safety, Oxford Fire Department, Creedmoor Volunteer Fire Department (VFD), Providence VFD, Brassfield VFD, Epsom Fire Department, and Youngsville Fire Department. The training burn consisted of a series of fires set by instructors in each room of the single-story farmhouse. Following the lighting of each fire, a team of firefighters entered the farmhouse to observe the fire’s behavior and then to extinguish the flames. This sequence was repeated several times to ensure that all student firefighters participated. Once all training exercises were completed, the instructors and safety officer allowed the flames to completely consume the structure. 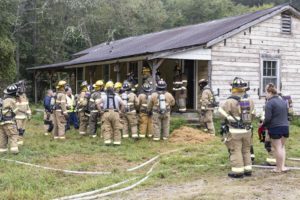 The training burn was conducted an 842-acre property located on Roberts Chapel Road near Stem that was purchased by TRLC from the Gantt family in December 2017. The Gantt property shields the eastern boundary of Camp Butner from residential development. The property also buffers six miles of streams that feed into Lake Holt, a reservoir supplying drinking water to Butner, Creedmoor, and Stem. The abandoned farmhouse on the property was built in the 1950s but had been used only as a hunting cabin in recent decades. To see photos and videos of the training burn taken by Granville County photographer Sam Upchurch, please visit https://www.flickr.com/photos/tarriverlandconservancy/albums/72157701684002035.